Flower decoration of the restaurant / cafe "Kant"
One of the main components of a successful and prosperous restaurant business is, undoubtedly, the comfort and beauty of its halls. The external appeal and interior of the restaurant should leave pleasant sensations for each client, which will create an interest to return to this institution more than once. In this case, the key element is the so-called spectacular design, in the creation of which the best assistants will be living flowers. Our company BuketLand recently held a flower decoration of the halls in the restaurant / cafe "Kant", which is located on Solomenka in Kiev. It is here that all lovers enjoy spending free time with their family or friends, while also having a tasty meal, the opportunity to dive into the interior of a classic Irish pub with retro elements. It would seem that it is difficult to even come up with such a style, it's not that harmoniously fit graceful, gentle and such exquisite creatures as fresh flowers. But our professional florists managed to make beauty even in this classic interior. Everyone knows that the traditional colors for the decoration of the hall in the Irish style is considered noble green and brown shades. Restaurant "Kant" was no exception. Since the "green" and so it was enough, we decided to make a few elegant, but at the same time not catchy accents in the form of floral compositions on the tables. They were collected from exquisite white freesias, combined with an unusual bruneia and green hypericum. The compositions had a horizontal shape, which did not heavier the interior and allowed visitors to communicate peacefully through desks. All the windowsills and wall shelves also acquired a new look. They were installed compositions of ivy, fresh apples and nuts. Such an unusual combination creates a magical atmosphere that can move for a couple of hours, without exception, to the friendly Ireland. At the bar, among all the variety of beer of all sorts and tastes, elite alcohol and other things, the vase with beautiful roses of the "Super Green" type harmoniously blended in with the inviting and pleasant aroma in addition to the magical appearance. It was not without the traditional symbolism of all pubs in Ireland - the green three-leaved clover. Unfortunately, to find this plant in fresh form is possible only in May-June, so we replaced it with no less beautiful artificial analogs. It is worth noting that after all the works the interior of the restaurant / cafe "Kant" has become more unique and much more interesting. We can say with full confidence that we managed to bring in the classic style of the Irish pub a little modernity, colors and freshness. The flower decoration of the halls in restaurants and cafes contributes not only to an increase in external appeal, but also to the creation of a certain image and your personal business card. 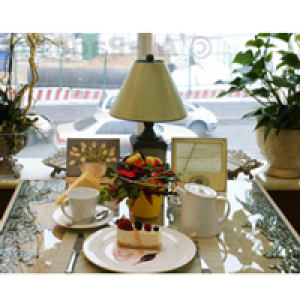 The company Buket Land is always happy to accept orders for the decoration of fresh flowers restaurants and cafes. 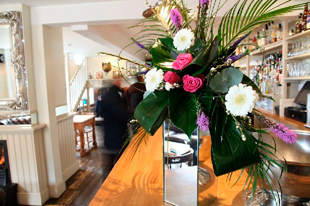 Our florists guarantee high-quality work and individual approach to each customer. We will pick up such design, which will be harmonious for your interior, at the same time place the accents where they are needed most. If you want to create an unusual and unique atmosphere in the interior of your cafe or restaurant, leave unforgettable impressions to the customers and give them a little magical beauty during a pleasant dinner or dinner, then the flower decoration service of the halls is created just for you! Live flowers can create an aura of peace and tranquility, while giving a pleasant scent and leaving an unforgettable impression of a well spent time in your restaurant.